Spaghetti squash is one of nature's most versatile foods! Both a pseudo-starch with a distinctive texture and well-rounded taste. 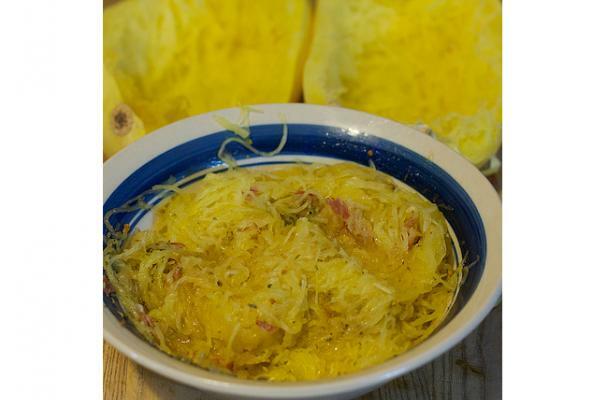 Shredded, spaghetti squash earns its name from the noodle like texture of its high-fiber, low-carb flesh. Roasted, steamed, shredded - all easy ways to prepare spaghetti squash. Creamy, aromatic and perfect year round. Earthy sage, creamy ricotta and mellow pine nuts compliment the natural sweetness of the squash in this tasty entree. This super tasty vegan dish also shows you now to roast a whole squash - how cool is that? Dressed to impress with coriander, cumin and fresh cilantro - simply refreshing. Fresh tomatoes, salty feta cheese and luscious black olives.